Some men are born great, others have greatness thrust upon them. Levi Charles Reardon is neither of those men. 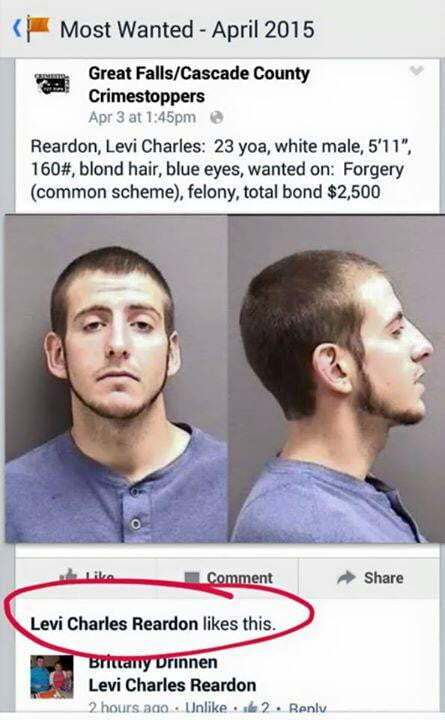 Reardon, who was wanted for theft and forgery in Cascade County, Montana, was perusing Facebook when he stumbled upon his own wanted poster on the local Crime Stoppers page. He then decided the best course of action would be to “like” his own wanted poster, chuckle to himself (speculation), and keep scrolling. Reardon was subsequently arrested without incident Friday morning and had his initial court appearance on felony forgery and theft charges earlier this week. According to the Great Falls Tribune, Reardon was held on $2,500 bond and in fact had not one but two warrants out for his arrest. His arraignment is scheduled for May 7. It seems Reardon was a suspect in a recent case involving a stolen wallet and personal checks. Again showing his intelligent side, Reardon attempted to cash four of the stolen checks after making them out in his own name. He had spoken previously with an officer regarding the theft after having been notified that checks made out in his name had been reported as fraudulent. Levi has found himself among the ranks of the great Internet geniuses. Just last year we covered the astute abilities of one Roger Ray Ireland, who boasted on Facebook that the police would never catch him and of course was swiftly arrested. Obviously Mr. Reardon did not read our article or he would have known not to interact with social media posts related to wanted criminals in his county. People can’t seem to stay away from Facebook kerfuffles, as is evidenced by this woman who posted a selfie of herself in a stolen dress and was … you guessed it, arrested. A PSA from Digital Trends: If you have committed crimes, or are wanted for crimes, stay off social media.